If the payment method which you choose when checkout fails and makes the transaction cannot complete, Magento 2 store system will send a notification to the customer to announce that problem automatically. Hence, in this article, we would like to show you a common method to configure the Payment Failed Emails sent to customers as your wish. All the email template must be updated to reflect your brand. Open the Admin homepage, then on the sidebar, click on Stores symbol. Next, choose Configuration under Settings. In the board on the left, choose Checkout under Sales category. In Payment Failed Email Sender field, choose the store contact which is considered as the sender of the message. In Payment Failed Email Receiver field, set the store contact that is purposed to receive notification of failed email transmissions. 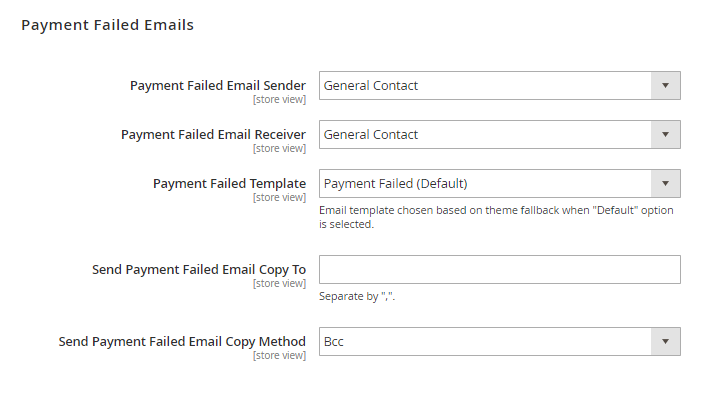 In Payment Failed Template field, choose the template purposed to be used for the Payment Failed Emails sent to customers. In Send Payment Failed Email Copy To field, enter email address of people who are supposed to receive a copy of the payment failed notification. In the context of sending Payment Failed Email Copy to more than one recipient, remember to separate each address with a comma. BCC: Send a blinds courtesy copy which means that all the recipients are included in the header of email and then the email will be sent to all of them at once. Of course, the BCC recipient is not visible to the customer. Separate Email: The copy is sent to customers separately. When complete, click on Save Config button to finish. If you find it helpful for you, please Like, Share and Subscribe to keep updating for more coming blogs!